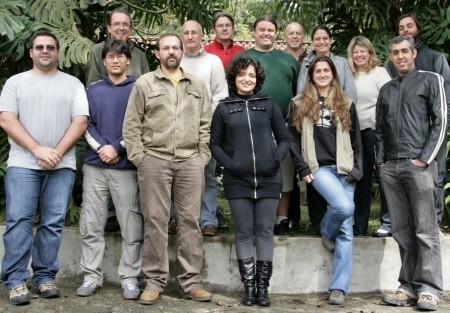 Amphibian Ark staff help coordinate ex situ programs implemented by partners around the world, with the first emphasis on programs within the range countries of the species. We are always aware of our obligation to couple ex situ conservation measures with the necessary efforts to protect or restore species in their natural habitats. Our Taxon Officers help to coordinate all aspects of implementation within the AArk initiative and assist AArk partners in identifying priority taxa for in situ or ex situ conservation work. An initial part of this process involves evaluating species, to help conservation managers maximize the impact of their limited conservation resources by identifying which amphibian species are most in need of particular types of conservation action. Ex situ conservation of a threatened amphibian species is considered a necessity when the imperative of in situ conservation cannot by itself ensure the survival of a species and its ecosystem. When ex situ management of an amphibian species is considered necessary and appropriate, the priority should be to establish the initiative within the range State of ecological origin. 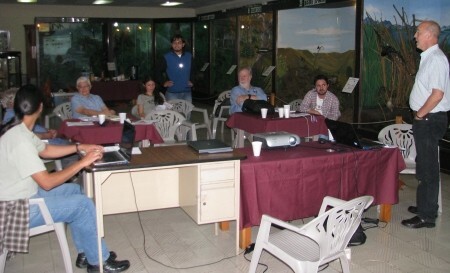 In 2006, CBSG and WAZA held an Amphibian Ex Situ Conservation Planning workshop in Panama, and during that workshop, a taxon selection and prioritization working group developed a series of questions to select and prioritize which taxa are most in need of ex situ assistance. The decision tree has subsequently been further reviewed and refined, and has now been developed into the AArk Conservation Needs Assessment process, (a Spanish version, Herramienta para Evaluar las Necesidades de Conservación de Anfibios, is also available) and a standardized electronic data entry tool, using Microsoft Excel. The assessment process has proven to be a logical, transparent, and repeatable procedure for guiding amphibian conservation activities within a country or region. An article describing the Conservation Needs Assessment was published in the journal Oryx in June 2018: A process for assessing and prioritizing species conservation needs: going beyond the Red List. Supplementary material is also available. Generally, the ex situ conservation community lacks specific knowledge to determine which species are most at risk in the wild, and which species need immediate rescue to avoid extinction. 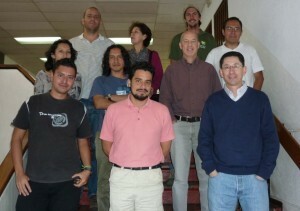 When preparing for an AArk Conservation Needs Assessment workshop, we rely heavily on the local IUCN SSC Amphibian Specialist Group Chairs to assemble a similar team of experts to that which led the original 2004 Global Amphibian Assessment, but this time with a goal of updating the information and separating out and assessing all taxa to determine the best conservation actions to help ensure their ultimate survival in the wild. The assessment results in a series of reports for nine different conservation actions. Species are listed according to their priority for the particular conservation action, and the supporting documentation provides a guide for those species which have the most chance of benefiting from the prescribed conservation action(s). Since 2007, we have facilitated assessment of the conservation needs of 3,375 (46%) of the world’s amphibian species through 26 national or regional workshops. 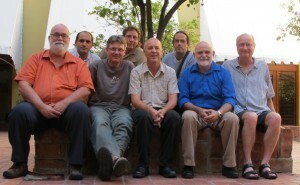 Additional workshops are planned for other countries and regions over the coming months. A summary of the results of previous assessment workshops are available on on the Assessment Results page of our web site, and the complete assessments can be found on the Conservation Needs Assessment program at www.ConservationNeeds.org. In early 2015, the assessment process was migrated to an online format, allowing for more inclusive access for assessors, with concurrent national assessments being made at the same time. The benefits of this assessment process are clear – we assemble the leading amphibian field experts in each region, to collectively determine the best course of conservation actions to help prevent the extinctions of threatened amphibian species in the wild. These actions include habitat restoration and preservation, threat mitigation, captive breeding for release and community awareness and involvement. Without immediate captive management as a stopgap component of an integrated conservation effort, hundreds of species could become extinct. Because ex situ resources are limited, the Amphibian Ark must try to identify which species require ex situ management most urgently. During the last day of the workshop, participants drafted the outline for a National Amphibian Action Plan for the Philippines, and allocated authors for each section of the document. This will be a detailed national action plan, and will include the priorities and recommendations produced during the workshop. It is anticipated that the action plan will be published before the end of 2014. As with other recent amphibian conservation needs assessment workshops, AArk staff are working with the local amphibian conservation community to identify a suitable person to appoint to a half-time National Amphibian Conservation Coordinator position for a period of 12 months. This person will work with participants from the assessment and other stakeholders to complete the writing and publishing of the national amphibian action plan and will then help to develop further species-level conservation action plans and to help forge new partnerships, both in-country and internationally, to ensure that recommendations from the workshop are implemented in a coordinated way. Funding is being sought to employ a suitable candidate. Experience has shown that having a person dedicated to this type of role for a period after the assessment workshop will lead to a more coordinated response, and conservation programs which have a better chance of achieving their aims. AArk staff will continue to provide support and advice as required, to ensure the best possible outcomes for the long term survival of amphibians in the wild in the Philippines. 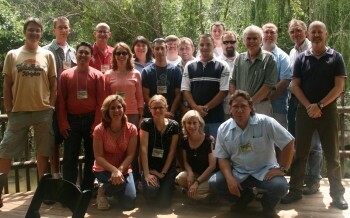 The complete results from the workshop are available on the Conservation Needs Assessment web site. Funding for the workshop was generously provided by Chester Zoo and the University of Santo Tomas, with the University of Santo Tomas providing the workshop venue and equipment. 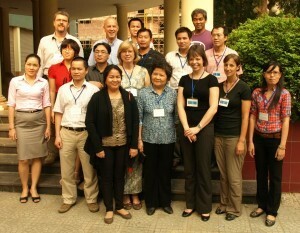 The Institute of Ecology and Biological Resources, at the Vietnamese Academy of Science and Technology in Hanoi, Vietnam, hosted a five-day amphibian conservation needs assessment workshop in March 2012. During the workshop, the conservation needs of 203 species of amphibians occurring in Vietnam, Laos and Cambodia were assessed. Twenty participants met during the five-day period, with representatives from Vietnam, Laos, Cambodia, Germany, France, China, Australia, the Philippines, and the USA. The workshop was jointly funded by grants from the Conservation Food and Health Foundation, the Conservation and Collection Management Committee of the Columbus Zoo and Aquarium, and the Prince Bernhard Fund For Nature. 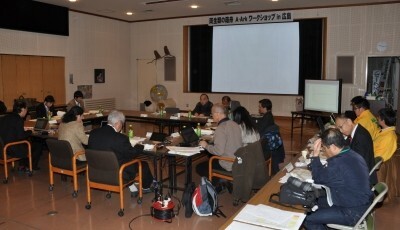 Two main issues were re-iterated during the workshop. Firstly, there is very little known about many amphibian species in the wild in Vietnam, Laos and Cambodia, and a great deal more field research is required to obtain a thorough understanding of the status of the region’s amphibians. Secondly, although a number of species occur in protected areas within the region, most of these protected areas are not providing effective protection, and there is still collection of animals, habitat destruction for agriculture and mining taking place in these areas. This is especially evident in Cambodia where there is almost no real protection for natural habitat. 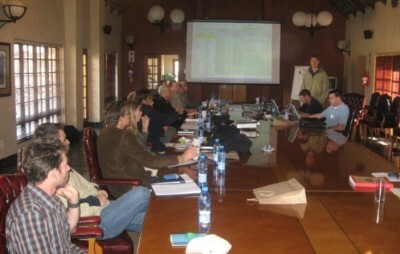 During the workshop, 90 species were recommended for in situ conservation work to ensure their survival in the wild, 123 species (mostly classified as Data Deficient) require additional in situ research to determine their distribution or the threats they face, 5 species were identified as husbandry analogs for more threatened species or for ex situ research, 81 species were identified as being suitable for conservation education purposes and there were 25 species that do not require conservation action at this time. There are also a number of species that require further taxonomic work to determine correct species limits. From October 31st – November 5th, Wildlife Reserves Singapore hosted an Amphibian Conservation Needs Assessment workshop and an Ex Situ Amphibian Conservation workshop, at Singapore Zoo. Around 35 people attended these workshops, which not only reviewed the conservation requirements of Singapore’s amphibians, but also provided guidance and training for staff from the new River Safari park which will include a number of amphibian conservation projects when it opens in 2012. The workshop was funded by the Wildlife Reserves Singapore Conservation Fund. 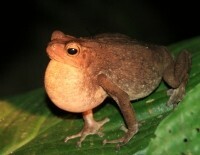 The first three days of the workshop were devoted to field conservation of amphibians and included the conservation needs assessment, and a number of presentations and hands-on sessions focusing on Singapore’s amphibians and a variety of techniques used in the field during amphibian research trips. The assessment was facilitated by Kevin Johnson from the Amphibian Ark, and participants included staff from Wildlife Reserves Singapore, National Parks Board of Singapore, and the National University of Singapore. Presentations were given by Dr. Tzi. Ming Leong and Dr. David Bickford from the National University of Singapore, Dr. Nancy Karraker from the University of Hong Kong, Dr. Brad Wilson from Atlanta, USA, Dr. Phil Bishop from the Amphibian Survival Alliance and Ron Gagliardo from Amphibian Ark. Twenty-eight amphibian species were assessed during the workshop, with one species, Malaysian Horned Frog, Megophrys nasuta, being recommended for an ex situ rescue program. Eight species were recommended for in situ conservation actions, seven species require additional in situ research to be undertaken, two species were recommended for ex situ research, twelve species are suitable for either in situ or ex situ conservation education programs, and one species was recommended for cryopreservation. Fourteen species were considered to be currently safe in the wild, and not in need of any conservation action at this time. The inclusion of a number of presentations and hands-on sessions was a first for an Amphibian Ark assessment workshop, and was very well received by the participants. These sessions provided a great insight into general amphibian biology, an overview of the amphibians of Singapore, specific field techniques such as capture and restraint, weighing, identification and sexing, minimizing the risk of disease transfer, and sampling techniques and protocols. An evening field trip to two sites in the Bukit Timah Nature Reserve was also included, during which, 14 species of amphibians were sighted. Amphibian Ark staff would like to thank the Wildlife Reserves Singapore Conservation Fund for their very generous support of this workshop, staff from Wildlife Reserves Singapore for their wonderful hospitality and friendship during the workshop, and all of the participants for their involvement during the workshops. We’re looking forward to seeing some great new amphibian exhibits and conservation programs at the River Safari when it opens next year. The complete results from the workshop are available on the Assessment Results page. 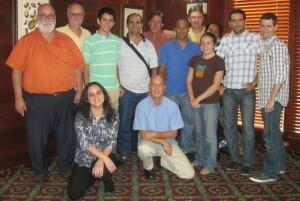 In March 2011, Amphibian Ark staff facilitated two Amphibian Conservation Needs Assessment workshops in Santo Domingo, Dominican Republic, in the Caribbean. 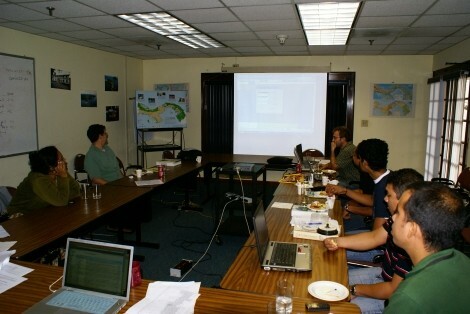 The first workshop, which also included the updating of many Red List Assessments, focussed on species from Haiti, the Dominican Republic and Jamaica. The second workshop assessed the amphibians of Puerto Rico and Cuba, plus a few species from the Lesser Antilles. During the nine days, sixteen field experts and observers worked with staff from the AArk, IUCN Amphibian Specialist Group and Conservation International, with various sub-groups being formed as necessary to tackle multiple assessments at the same time. One hundred and seventy-eight amphibian species were assessed for their conservation needs of which, 54 species occur in Haiti, 44 in the Dominican Republic, 24 in Jamaica, 62 in Cuba, 22 species in Puerto Rico and 6 from the Lesser Antilles. The assessment process resulted in the following recommendations: 25 species in need of ex situ Rescue programs; 112 species could still be saved in the wild with in situ conservation action; 41 species require further in situ research to determine more about the species population status and/or the threats they face; 78 species are currently undergoing, or are proposed for specific ex situ research that contributes to the conservation of the species, or a related species; 90 species that are suitable for either in situ or ex situ conservation education programs; and 26 species recommended for cryopreservation. Only 12 species were not recommended for any conservation action. We are currently identifying additional field experts in the Lesser Antilles and Trinidad & Tobago to help complete the assessments for those islands. Data sheets will be updated as additional assessments are made. During the workshop we reviewed the results of the species assessments for each country and discussed options for following up with various conservation actions identified during the workshop. Volunteers were identified in each country to be the focal point for continued actions, assessment updates, and to encourage amphibian conservation activities for the countries. 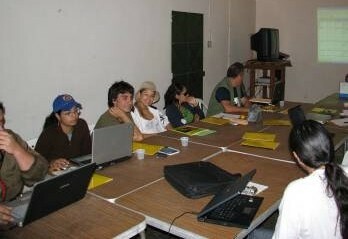 These volunteers are: Susan Koenig and Iris Holmes for Jamaica; Rafael Joglar for Puerto Rico; Sixto Inchaustegui for the Dominican Republic; Luis Díaz and Ariel Rodríguez for Cuba and Joel Timyan for Haiti. We also spent several hours on the last day of the workshop discussing ex situ amphibian husbandry issues, with many examples of both simple and sophisticated facilities being shown and discussed. Participants found this particularly helpful, and they gained many good ideas to put into practice at their own facilities. Workshop participants enjoyed three trips during the workshop: a night walk around Parque Zoológico Nacional (ZooDom); a field trip to a wonderful cloud forest in the 23 km2 protected area Reserva Científica de Ebano Verde; and a night trip to the Santo Domingo Botanical Gardens. Several frog, lizard and snake species were found during these trips, as well as a couple of huge tarantulas. We’d like to extend our thanks to Adrell Núñez from ZooDom and Miguel Landestoy for their hospitality in providing these trips for us, thereby allowing us all to experience a little of the local flora and fauna. We’d also like to thank the Mohamed bin Zayed Species Conservation Fund, which provided the funds to support this workshop. 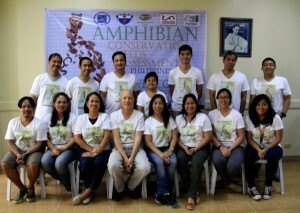 A well-attended and very successful Amphibian Conservation Needs Assessment workshop was carried out from 23-25 October. It was co-funded by a Durrell Wildlife grant from USA Fish & Wildlife Service (capacity building for cnservation of amphibians in Argentina), Chester Zoo, AArk/EAZA, and the Buenos Aires Zoo who kindly hosted, providing a venue, equipment and copious refreshments. 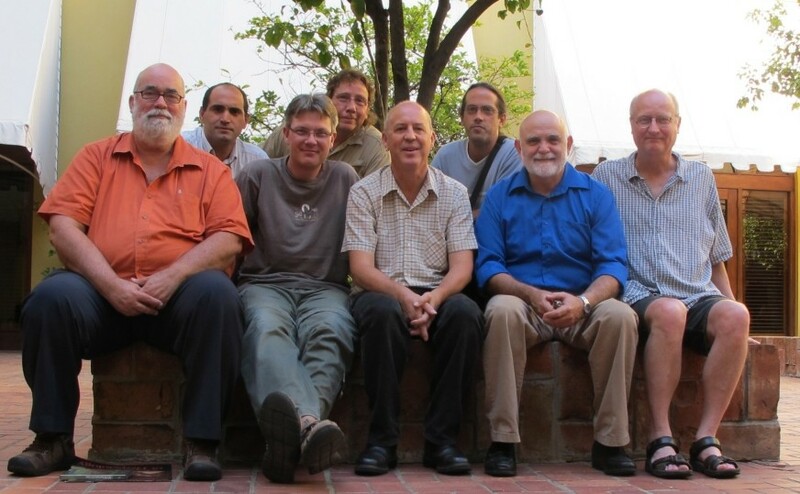 The workshop was organised under the auspices of the IUCN Amphibian Specialists Group-Argentina, with most of the hard work being done by Marcos Vaira and his students. It was attended by eighteen amphibian biologists, PhD students, zoo professionals and government officials representing all regions of the country, and facilitated by AArk Taxon Officer Richard Gibson (Chester Zoo) and Luis Carillo (Zoofari, Mexico). Six species were identified for urgent ex situ rescue programs while eighteen were considered recoverable in situ if action was taken swiftly. Forty-one species need significant in situ research in order to determine threat levels, including impact of trade, population status and protected area coverage. The complete results from the workshop are available on the Assessment Results page. Much time was spent discussing the next steps in using the data from the workshop as a basis for a generic amphibian conservation action plan for Argentina and as a guide for species-specific recovery programs. AArk Taxon Officer Richard Gibson facilitated an Amphibian Conservation Needs Assessment workshop in Kandy, Sri Lanka on 2nd and 3rd November 2009. The workshop was organized by regional Amphibian Specialist Group Co-chair Anslem de Silva and was well-attended with twenty-four participants from a variety of backgrounds, many of whom were generously supported by Rohan Pethyiagoda, the Sri Lanka government’s Biodiversity Secretariat and grants from Durrell Wildlife Conservation Trust’s International Training Centre. Two days of intensive discussion and deliberation, expertly assisted by Durrell Wildlife’s Gerardo Garcia and Jamie Copsey, resulted in a comprehensive assessment of the conservation needs for Sri Lanka’s 107 named species of frogs and caecilians and a draft Red List assessment for two newly-described species Philautus singu and Philautus tanu – both provisionally assessed as Endangered on the basis of limited distribution and extent of occurrence. Perhaps the most exciting revelation of the workshop was that at least one species thought to be extinct, Adenomus kandianus, is now thought to have been rediscovered – great news for Sri Lanka and the world amphibian conservationists alike. Ten species of frog were considered to be so close to extinction that ex situ ‘Rescue’ programs are justified while more encouragingly, a further twenty-two threatened species could probably be saved in situ with dedicated conservation action. Thirty-three species were identified which would benefit from ex situ research initiatives, reflecting both the relatively recent discovery of much of Sri Lanka’s amphibian diversity and the paucity of ecology and life-history studies. Approximately a quarter of the known species were recognized as having educational potential either nationally or locally and through a variety of means including public exhibition. With a brand new government zoo under development, guidance on educational and research program species couldn’t come at a more appropriate and convenient time. 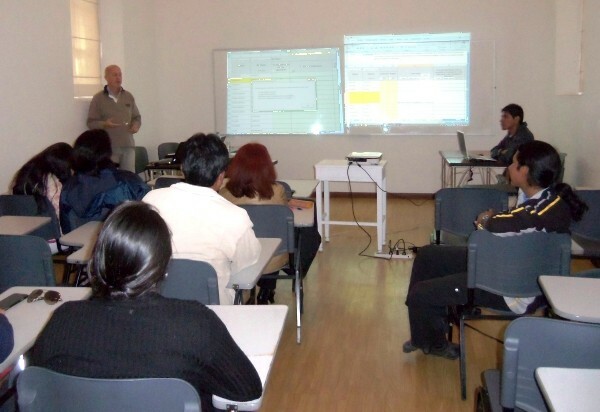 The complete results from the workshop are available on the Assessment Results page. Twenty-two participants representing seven organisations gathered at Ocean Park Hong Kong on May 22nd 2008 for the start of a two-day amphibian workshop. The two main aims of the workshop were to present a series of papers outlining some of the amphibian conservation activities that are currently underway in Hong Kong and Guangdong Province, and to attempt to assess and prioritize all amphibian species from the two areas for potential ex situ conservation programs. A number of presentations were given during the morning of the first day, and this was a great way for the presenters to share the work they are involved in with the other participants. The scope of the amphibian species prioritization workshop was all amphibian species in Hong Kong and Guangdong Province. This included 24 species that occur in Hong Kong, with one of these, Philautus romeri, being endemic. The species from Hong Kong included 2 Endangered, 2 Near Threatened, 2 Vulnerable, and 18 Least Concern species. All of these species, except for Philautus romeri also occur in the Guangdong Province. An additional 42 species that occur in the Guangdong province, but not in Hong Kong, were evaluated during the workshop. Of the 66 species evaluated, three species, Andrias davidianus (Chinese Giant Salamander, 大鯢), Philautus romeri (Romer’s Tree Frog, 香港(羅氏)小樹蛙) and Cynops orphicus (Dayang Newt, 潮汕蠑螈) were ranked considerably higher than the remaining species. A number of research projects are underway in China with Andrias davidianus and considerable experience exists with commercial farming of the species. A captive program already exists for Philautus romeri, with Kadoorie Farm & Botanic Gardens and Ocean Park already involved in captive breeding and release of the species. The complete results from the workshop are available on the Assessment Results page and a more detailed report of the workshop is also available. 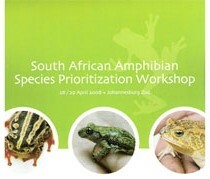 More than 200 southern African amphibian species were prioritized for conservation action during a two-day AArk-facilitated prioritization workshop hosted by the Johannesburg Zoo. About twenty amphibian experts from all walks of life – field, university, museum, zoo, NGO, government and students – gathered to consider and answer the various questions needed to identify ex situ roles and priorities among the region’s threatened frogs. AArk Taxon Officer Richard Gibson facilitated the meeting, ably assisted by Jesse Krebs from Omaha’s Henry Doorly Zoo who expertly manipulated the Global Amphibian Assessment (GAA) files for reference by the participants. Four species were recommended for urgent rescue programs, twenty species for ex situ research initiatives to investigate both biology and husbandry, and fifteen species were identified as suitable for educational purposes. Interestingly, two of the latter educational species are actually seriously threatened but it was considered that a concerted educational effort was likely all that was necessary to improve their status. The process ran very smoothly, with the support of all present, and resulted in a tidy list of species prioritized for Rescue, Research and Educational purposes. Prioritization of about 35 species from Angola, Malawi, Tanzania, and Zimbabwe was not completed owing to lack of information and familiarity with them in the wild. Further assistance will be sought to complete these species scores in coming weeks. The complete results from the workshop are available on the Assessment Results page. Additional information is being gathered for those species which couldn’t be adequately prioritized with the expertise present at the meeting. Zoo Negara in Kuala Lumpur, Malaysia, hosted an Amphibian Workshop in January 2008. Thirty-nine delegates from eight countries attended the workshop, which was held in the magnificent Palace of the Golden Horses hotel. The first day of the workshop began with an opening ceremony, with a number of distinguished guests, and was followed by an afternoon of presentations from some of the delegates, in a regular conference format. This was a great way for each of the participants to learn more about the work their colleagues have been involved in, and for the delegates to outline their particular interests and the projects they and their institutions are involved in. Two separate simultaneous workshops were then run over the following two days, one focusing on amphibian species prioritization, and the other focusing on the ex situ management of amphibians. Participants in the species prioritization workshop used the Amphibian Ark species selection and prioritization tool to evaluate 211 species which occur in Malaysia. Sixty-two of these are endemic species. Seven additional taxa (Ansonia latifi, Ansonia latirostra, Ansonia endauensis, Ansonia sukumarani, Ingerophrynus gollumi, Rana monjerai and Theloderma licin) were added to the species from the Global Amphibian Assessment’s list of Malaysian taxa. Unfortunately the participants at the workshop did not have enough information regarding forty-six of the species, and these were only partly evaluated. Other Malaysian amphibian experts were identified, and these people have been asked if they would be willing to assist in completing the evaluation of these forty-six species. The participants collectively came up with common analogue species for the ten highest ranking species, and suggested that the ex situ community in Malaysia uses these analogues to gain husbandry and reproductive experience, before working with the more endangered species. The complete results from the workshop are available on the Assessment Results page and a summary report of the workshop is also available.